Israeli soldiers kidnapped, on Wednesday morning, ten Palestinians, including a woman and five children, in different parts of occupied East Jerusalem, and one in Ramallah. Two children and three teenagers have also been kidnapped in Jerusalem, on Tuesday evening.Head of the Jerusalem Detainees Committee, Amjad Abu ‘Asab, said the soldiers stormed and violently searched a number of homes, and kidnapped five Palestinian teenagers. He stated the kidnapped have been identified as Mohammad Talhami, 17, and Ashraf Haroun Borqan, 18, from the ath-Thoury neighborhood, Shadi al-‘Abbassi, 16, and Ahmad Abu Qalbein, 15, from Ras al-‘Amoud, in addition to Khaled Darwish, 17, from the al-‘Eesawiyya town. Abu ‘Asab added that the kidnapped Palestinians were moved to an interrogation center in the city, and will be sent to court as the prosecution is demanding remand for further interrogation. The woman was moved to the al-Qashla Police station in the city, and was released on a 5000 New Israeli Shekels bail, in addition to being denied access to the Al-Aqsa Mosque for 15 days. The Police also ordered three recently kidnapped Palestinians from the city under further interrogation. They have been identified as Mohammad ad-Deeb, Mustafa Mawasi, and Shadi Sha’abna. In addition, several Israeli military vehicles invaded a number of neighborhoods in the central West Bank district of Ramallah, and kidnapped a university student. Local sources said the soldiers kidnapped Islam Foqaha, 20, a student of the Modern University College, and took him to the ‘Ofer military base, near Ramallah. 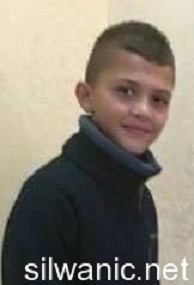 On Tuesday evening, soldiers kidnapped a Palestinian child, identified as Mahdi Hatem Abu ‘Asab, 11 years of age, in the al-Qarmi neighborhood in Jerusalem’s Old City, and took him to an interrogation facility. The soldiers released the child after interrogating him for several hours. In addition, army kidnapped three Palestinian teens, identified as Mustafa Abu Hadwan, 17, Mohammad Qerrish, 18, and Nour Castero, 17, in Beit Hanina neighborhood, in Jerusalem.